What better way to help you understand some of the internship opportunities available to you as a member of the Cornell Energy Club (CEC), than to have the students themselves share their experiences. Most students are wrapping up their internships or will soon start to wrap up their internships, and as a result we touched bases with some of them to get a feel of some of the energy roles they embarked on this summer. This is Rob Brink checking in from the GE Renewables headquarters in upstate NY, a little more than halfway through the internship project and absolutely loving it. I'm based on the Marketing Strategy team representing Energy Storage, a market where GE has been making some big moves. My partner and I started off doing market sizing and analysis for different energy storage uses, but it has quickly morphed into helping make go / no-go decisions on numerous projects, as well as informing the strategic focus of the business. As an intern, it's hard to imagine having a more impactful experience, and as a clean tech enthusiast I really couldn't ask for a more exciting position. Between preparing for our report-out to the head of the Renewables business in a couple weeks and making sure to connect with as many people here as possible, it's going to be a sprint to the end of the internship. Looking forward to sharing more about the experience to fellow club members in the fall. We will continue to share periodic updates on the internships embarked upon by our members. But should you have questions or would like to get in touch, do not hesitate to contact us. Posted on August 2, 2015 by Johnson Energy Club. One of the main objectives of the Cornell Energy Club (CEC) is to provide energy-focused educational opportunities to members of the club. In fulfilling this objective, the CEC organized a visit to the Cornell Combined Heat and Power Plant (CCHPP) on April 30th 2015. The 25+ students in attendance, mostly Johnson students, were treated to the technological marvel of the CCHPP. 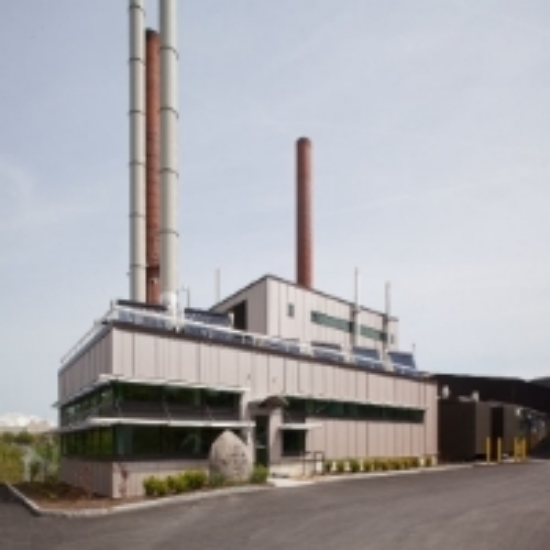 The system, as described on CCHPP’s website, includes two Solar Titan combustion turbines (15 MW each) coupled with Rentech heat recovery steam generators. Each turbine combusts natural gas to provide the power needed to turn an electric generator. Excess heat leaving the gas turbine is recycled through the heat recovery steam generator to produce steam for campus needs. The CCHPP generates approximately 180 GWh yearly meeting majority of the campus electrical power needs. The event, which lasted approximately one hour, gave students an opportunity to learn about how Cornell meets its total electricity demands, its winter heating demands, and strategies being taken to mitigate the effects of outages should they occur. Feel free to reach out to Aditi Srivastava or any of the board members should you have more questions. Posted on May 6, 2015 by Johnson Energy Club. Last week I made my radio debut on 88.1 WRFI in Ithaca, NY. I had the privilege to be the guest for The Forecast, a local radio show dedicated to educating listeners about climate change related issues. The interview began with questions on the triple bottom line (i.e. people, planet, and profit). From there we discussed the bus I organized to the People’s Climate March, how climate change is viewed in MBA and business settings, and the fossil fuels divestment campaign. After a few softballs, Art, a renewable energy entrepreneur and host of the show, got into the tougher questions of whether or not our economic system was up to the task of addressing climate change. I responded that I thought it was, but not without changes. First, negative externalities around fossil fuels needed to be addressed by putting a price on carbon. This would help enable the second major change needed which is to move to a circular economy. Today’s economy depends on a Take-Make-Waste model where “Take” (resource extraction) and “Waste” (pollution) cause serious environmental degradation. A carbon price would reveal the true cost of extraction and pollution thus supporting a closed-loop, or circular economy. The show ended with Art asking me about how to “get through” to evangelicals (I’m Mormon) about climate change. It's been my experience that evangelicals tend to be skeptical about climate change because of their political beliefs, not because of their religious beliefs. Therefore, making the connection between conservative values and environmental stewardship would yield the best results. Feel free to listen to a recording of the show on the show’s website. Posted on April 27, 2015 by Johnson Energy Club. I spent three days in the future Feb. 9 through 11, and I’ve returned to tell you: It’s a brave new world. I’ve seen 3D-printed cars; synthetic chemical processes that, when genetically spliced into plants, make them grow faster; radiative panels that passively cool buildings in direct sunlight; a backpack that, when worn through a building, produces a full-3D model instantly; and, perhaps most notably, a chemical coating that allows ALL of the ketchup to slide out of the bottle. A brave new world indeed. During the first day, Bill Gates set the tone for the rest of the conference: “We want energy to be carbon-free.” There was a tangible sense of excitement at the conference for the maturation of disruptive technologies such as energy storage and next generation renewables that will be critical in addressing the climate crisis. Ahmad Chatila, CEO of SunEdison, the largest renewables developer in the world, pronounced that “energy storage is the most important thing right now—it will change the world as we know it.” He went on to predict that it will unlock widespread adoption of electric vehicles and intermittent sources of electricity generation such as wind and solar. Indeed, Lyndon Rive, CEO of SolarCity, reminded attendees that, of all new electricity generation added to the grid in 2014, solar was the largest, beating out both coal as well as gas. Balancing the idea that technology alone will solve our problems, Alex Laskey, president and founder of Opower, spoke of the importance of feedback loops and behavioral economics in addressing our energy profligacy. Despite the intractable problems before us, it was difficult to leave the summit without a sense of awe and hope for our future. Johnson has enabled me to do more than simply witness the clean tech revolution; I feel like a key player in driving its destiny. Welcome to the future.